The PhD Summer School is an annual event that is organized at Microsoft Research Cambridge in relation to the Microsoft Research PhD Scholarship Programme. 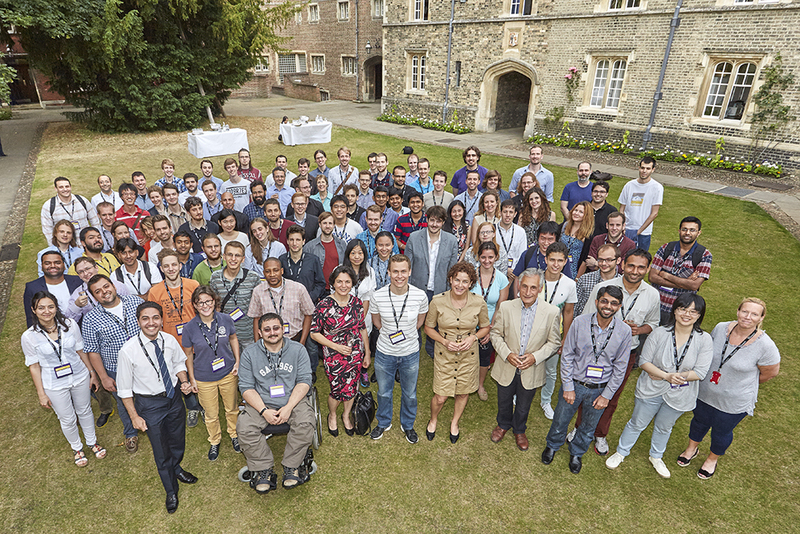 The tenth Microsoft Research Summer School took place at Microsoft Research in Cambridge, UK, from 29 June to 3 July 2015. It included a series of talks of academic interest, transferable skills talks, and poster sessions that provided invited students the opportunity to present their work to Microsoft researchers. Dave Yewman, Elevator Speech Inc. There is a joke where a physicist and a mathematician are asked to herd cats. The physicist starts with an infinitely large pen, which he reduces until it is of reasonable diameter yet contains all the cats. The mathematician builds a fence around himself and declares the outside to be the inside. Defining memory models is akin to herding cats: both the physicist’s or mathematician’s attitudes are tempting, but we cannot rely on one more than on the other. I study concurrent systems, trying to understand precisely what our machines guarantee. This is crucial for writing correct programs, especially since modern machines force us to revise the programming model that we have been taught at school, namely Lamport’s Sequential Consistency. In this talk, I will show ways of defining formal models for concurrency, within a generic framework in which one can represent for example Sequential Consistency, Intel x86, IBM Power, ARM, C++ and GPUs. Jade Alglave is a researcher at Microsoft Research Cambridge, and a lecturer at University College London. She tries to develop formal models of concurrent systems within a unifying framework, and use these models for verification purposes. The Human Experience & Design Group at Cambridge designs and fabricates new human experiences with computing. These play on many different kinds of human values, from amplifying efficiency and effectiveness to creating delight and wonder in our interactions with technology. And they can be situated in any aspect of everyday life, from increasing productivity in the workplace to respecting the tenderness of family life. In this talk, Richard Banks will give an overview of the work of the team, describing how the disciplines of social science, computer science and design work together as a multi-disciplinary unit, and showing a number of working projects and prototypes. Richard Banks is principal design manager in Microsoft Research’s Cambridge lab. Working as part of the Human Experience & Design group he collaborates with social scientists and computer scientists in the lab on a broad range of projects that span device development, community engagement, gestural interaction and more. Richard is author of The Future of Looking Back, a book which focuses on new digital legacies and the impact they’ll have on how we reminisce about our lives. He is honorary professor of design at the University of Dundee, a fellow of the Royal Society of Arts and external examiner for Edinburgh University’s Design Informatics course. Analysis of medical images is essential in modern medicine. With the ever-increasing amount of patient data, new challenges and opportunities arise for different phases of the clinical routine, such as diagnosis, treatment, and monitoring. Development of natural user interfaces for medical practitioners. In June 2000, Antonio Criminisi joined Microsoft Research in Cambridge (Machine Learning and Perception group) as a visiting researcher. In February 2001, he moved to the Interactive Visual Media Group in Redmond (WA, United States) as a post-doctorate researcher. In October 2002, he moved back to the Machine Learning and Perception Group in Cambridge as a researcher. In September 2011, he became senior researcher and is now leading the Medical Image Analysis team. Antonio’s current research interests are in the area of medical image analysis, object category recognition, image and video analysis and editing, one-to-one teleconferencing, 3D reconstruction from single and multiple images with application to virtual reality, forensic science, and history of art. Antonio Criminisi was born in 1972 in Italy. In October 1990, he was appointed “Alfiere del Lavoro” by the Italian President F. Cossiga for his successful studies. In July 1996, he received a degree in Electronics Engineering at the University of Palermo and in December 1999, he obtained a PhD in Computer Vision at the University of Oxford. His thesis. Accurate Visual Metrology from Single and Multiple Uncalibrated Images, won the British Computer Society Distinguished Dissertation Award for the year 2000 and was published by Springer-Verlag London Ltd. in August 2001. Antonio was a Research Fellow at Clare Hall College, Cambridge from 2002 to 2005. Antonio has won a number of best paper prizes in top computer vision conferences. From time to time at Microsoft Research, we set aside time to talk about strategic aspects of research, that is, the big picture of why we do research and how to have different sorts of impact, beyond the more immediate tasks of writing papers, giving talks, and transferring ideas. This talk will cover some of these strategies for having a happy and productive career as a researcher. The Technology Development lecture starts with an overview of general purpose technologies, which changed the world economy 24 times. It then focuses on computing and how it developed its own characteristics and lead companies. The lecture then concentrates on machine learning and artificial intelligence as technologies which could transform not just our economy but every aspect of our future lives. These are man’s most powerful-but also most unpredictable-technologies. Aspects of the speed with which this transformation could happen will be discussed together with the consequences it may have for employment and how likely it is that super intelligences will emerge and when. In 2015, Hermann was awarded a KBE for services to Engineering and Industry. Serial entrepreneur and co-founder of Amadeus Capital Partners, Dr. Hermann Hauser CBE has wide experience in developing and financing companies in the information technology sector. He co-founded a number of high-tech companies including Acorn Computers which spun out ARM, E-trade UK, Virata and Cambridge Network. Subsequently, Hermann became vice president of research at Olivetti. During his tenure at Olivetti, he established a global network of research laboratories. Since leaving Olivetti, Hermann has founded over 20 technology companies. In 1997, he co-founded Amadeus Capital Partners. At Amadeus, he invested in CSR, Solexa, Icera, Xmos and Cambridge Broadband. Hermann is a Fellow of the Royal Society, the Institute of Physics and of the Royal Academy of Engineering and an Honorary Fellow of King’s College, Cambridge. In 2001, he was awarded an Honorary CBE for ‘innovative service to the UK enterprise sector’. In 2004, he was made a member of the Government’s Council for Science and Technology and in 2013, he was made a Distinguished Fellow of BCS, the Chartered Institute for IT. Regular algebra provides a full set of simple laws for the programming of abstract state machines by regular expressions. They apply equally to sequential programs run on real computers. When extended by similar laws for interleaving of regular expressions, they apply also to programs for modern concurrent and distributed systems. Evidence for this claim is given by deriving from the algebra a concurrent extension of Hoare Logic (O’Hearn’s separation logic), and also an operational semantics for Milner’s process calculus (CCS). In 1956, I graduated from Oxford University with an MA in classics and philosophy. I was fascinated primarily by the philosophy of mathematics, and studied the logical foundations from books by Quine and Russell. In my first industrial job (1960) for a computer manufacture, I led a project implementing a classical programming language, ALGOL 60. The implementation was based on the novel context-free syntactic definition of this language. In my first academic employment, I resolved to provide a logical foundation for the semantics of a programming language as well. Other semantic definitions have been strongly promoted and widely used-for example, denotational, algebraic, and operational. These were often regarded as rival approaches. In my recent research at Microsoft, I have discovered that all four foundations are complementary presentations of essentially the same theory. In my first academic employment at the Queen’s University, Belfast, I resolved to provide a logical foundation for the semantics of a programming language as well. This was later called Hoare Logic, and gave a method of assuring correctness of programs. Performance predictability is a key requirement for high-performant applications in today’s multi-tenant massive-scale data centers hosting hundreds of thousands of servers. Online services like search or social networks running in infrastructure data centers need such predictability to satisfy application Service Level Agreements (SLAs); for example, online search queries need to be responded within a few hundred milliseconds. Cloud data centers require guaranteed performance to bound customer costs and spur adoption. However, several components of today’s datacenters are at odds with such high-level application SLAs. Thomas Karagiannis is a researcher in the Systems and Networking group at Microsoft Research Cambridge, UK since 2006. Prior to joining Microsoft Research, Thomas has been with Intel Research Cambridge and the Cooperative Association for Internet Data Analysis (CAIDA). Thomas’s work focuses on improving the performance and predictability of various types of computer networks, such as home or datacenter networks. Thomas received his Ph.D. degree in Computer Science from the University of California, Riverside and B.S at the Applied Informatics department of the University of Macedonia, in Thessaloniki, Greece. Besides datacenter networks, his research interests also include Internet measurements and monitoring, and social networks. DNA computing is emerging as a versatile technology that promises a vast range of applications, including biosensing, drug delivery and synthetic biology. DNA logic circuits can be achieved in solution using strand displacement reactions, or by decision-making molecular robots-so called ‘walkers’-that traverse tracks placed on DNA ‘origami’ tiles. Similarly to conventional silicon technologies, ensuring fault-free DNA circuit designs is challenging, with the difficulty compounded by the inherent unreliability of the DNA technology and lack of scientific understanding. This lecture will give an overview of computational models that capture DNA walker computation and demonstrate the role of quantitative verification and synthesis in ensuring the reliability of such systems. Future research challenges will also be discussed. Marta Kwiatkowska is Professor of Computing Systems and Fellow of Trinity College, University of Oxford. She holds a BSc/MSc in Computer Science from the Jagiellonian University, MA from Oxford and a PhD from the University of Leicester. In 2014 she was awarded an honorary doctorate from KTH Royal Institute of Technology in Stockholm. Marta Kwiatkowska spearheaded the development of probabilistic and quantitative methods in verification on the international scene. She led the development of the PRISM model checker (www.prismmodelchecker.org), the leading software tool in the area and widely used for research and teaching. Applications of probabilistic model checking have spanned communication and security protocols, nanotechnology designs, power management, game theory, planning and systems biology, with genuine flaws found and corrected in real-world protocols. Kwiatkowska gave the Milner Lecture in 2012 in recognition of “excellent and original theoretical work which has a perceived significance for practical computing” and was invited to give keynotes at the LICS 2003, ESEC/FSE 2007, ETAPS/FASE 2011 and ATVA 2013 conferences. Marta Kwiatkowska is a member of Academia Europea and Fellow of the BCS. Kwiatkowska’s research has been supported by grant funding from EPSRC, ERC, EU, DARPA and Microsoft Research Cambridge, including the prestigious ERC Advanced Grant VERIWARE “From software verification to everyware verification” and £5m EPSRC programme grant on Mobile Robotics. Internet advertisers reach millions of customers through practices that involve real time tracking of users’ online activities. The tracking is commonly conducted through browser cookies by third-party services that facilitate marketing campaigns and gather service analytics. By installing cookies on users’ computers, they track the users as they navigate from one site to another. Other trackers exploit shortcomings in the cache access control and apply cookie-less profiling. At the same time, user applications, such as commonly used Internet browsers, reveal little or no information about the information flow between the devices and services. That leaves the consumers with no insight about the breadth of the digital footprints they leave while interacting with services and no understanding of how that data is exploited. We outline a research agenda that investigates several aspects of this problem. That involves (1) characterizing the tracking ecosystem and the value exchange within it, (2) understanding of the users’ attitudes, behaviour, and awareness of the tracking practices, and (3) analysing the protocols and application design that contribute to the problem. We discuss the findings of several studies that investigate these issues. While they motivate us to think of alternatives to the privacy invading practices, they also urge deeper questions about the principles of design and comprehensibility of computing systems. As a principal researcher at Microsoft Research in Cambridge, Natasa is working on the design, prototyping and evaluation of information and communication systems. She is passionate about innovation in personal and social computing and promotes a dialogue between IT industry, consumers, and policy makers on the issues that arise from the adoption and use of technology. Her current focus is on digital obsolescence, automation of user tasks across devices and services, and privacy respecting systems and applications. Natasa is actively involved with a wider community of academics and practitioners through public speaking, collaborative projects, and serving on advisory boards of academic programs and commercial enterprises. She is a visiting professor at the UCL and QMUL and a member of the ACM EU Council. She serves on the advisory boards for the Course in Entrepreneurship University of Cambridge and for the Turing Gateway in Mathematics at Isaac Newton Institute for Mathematical Sciences (INI). Writing papers and giving talks are key skills for any researcher, but they aren’t easy. In this pair of presentations, I’ll describe simple guidelines that I follow for writing papers and giving talks, which I think may be useful to you too. I don’t have all the answers-far from it-and I hope that the presentation will evolve into a discussion in which you share your own insights, rather than a lecture. Simon Peyton Jones, MA, MBCS, CEng, graduated from Trinity College Cambridge in 1980. After two years in industry, he spent seven years as a lecturer at University College London, and nine years as a professor at Glasgow University, before moving to Microsoft Research in 1998. His main research interest is in functional programming languages, their implementation, and their application. He has led a succession of research projects focused around the design and implementation of production-quality functional-language systems for both uniprocessors and parallel machines. He was a key contributor to the design of the now-standard functional language Haskell, and is the lead designer of the widely used Glasgow Haskell Compiler (GHC). He has written two textbooks about the implementation of functional languages. More generally, he is interested in language design, rich type systems, software component architectures, compiler technology, code generation, runtime systems, virtual machines, garbage collection, and more. He is particularly motivated by direct use of principled theory to practical language design and implementation-that’s one reason he loves functional programming so much. He is also keen to apply ideas from advanced programming languages to mainstream settings. Scarlet Schwiderski-Grosche is a Senior Research Program Manager at Microsoft Research Cambridge, working for Microsoft Research Outreach in the Europe, Middle East, and Africa (EMEA) region. She is responsible for academic research partnerships in the region, especially for the Joint Research Centres with Inria in France and EPFL and ETH Zurich in Switzerland. Scarlet has a PhD in Computer Science from University of Cambridge. She was in academia for almost 10 years before joining Microsoft in March 2009. In academia, she worked as Lecturer in Information Security at Royal Holloway, University of London. Empirical Inference is the process of drawing conclusions from observational data. For instance, the data can be measurements from an experiment, which are used by a researcher to infer a scientific law. Another kind of empirical inference is performed by living beings, continuously recording data from their environment and carrying out appropriate actions. Do these problems have anything in common, and are there underlying principles governing the extraction of regularities from data? What characterizes hard inference problems, and how can we solve them? The talk will describe some of the main ideas and problems of machine learning. It will provide illustrative examples of real-world machine learning applications. Time permitting, it will touch upon recent developments in estimating causal structures, and/or probabilistic programming. Bernhard Schölkopf’s scientific interests are in machine learning and inference. In particular, he studies kernel methods for extracting regularities from possibly high-dimensional data. These regularities are usually statistical ones, however, in recent years he also got interested in methods for finding causal structures that underlie statistical dependences. He has worked on a number of different applications of machine learning, with a recent focus on photography and astronomy. Bernhard has researched at AT&T Bell Labs; at GMD FIRST, Berlin; and at Microsoft Research Cambridge, UK, before becoming a Max Planck director in 2001. He received the J.K. Aggarwal Prize of the International Association for Pattern Recognition, the Max Planck Research Award, the Academy Prize of the Berlin-Brandenburg Academy of Sciences and Humanities, and the Royal Society Milner Award. The last decade has witnessed rapid advancements in computer vision systems, not just in the world of gaming, but in many aspects of everyday life, from medical systems to augmented reality. Computer systems that “see” enable new forms of input, can track and identify people, can capture and model the physical world around us, and can be combined with other system capabilities such as conversational agents. But the challenge in developing these systems is much more than technical. In this talk, I explore the process of designing computer vision applications from a human perspective, and through our own attempts to build them for a variety of real world settings. In doing so, I propose that such systems need to make their users aware of the differences between how computer systems and how people sense, perceive, analyse and respond to the world. This has implications beyond computer vision to more general notions of “smart” systems in an era where artificial intelligence has again taken hold of our collective imagination. Abigail Sellen is a principal researcher at Microsoft Research Cambridge where she manages the Human Experience & Design Group. Prior to Microsoft, she worked at Hewlett-Packard Labs, Rank Xerox EuroPARC, Apple Computer, and Bell Northern Research. Abigail first became interested in human-computer interaction through a summer internship at Apple while working on her doctorate in cognitive science with Don Norman. She has since published extensively on many diverse topics, including the book The Myth of the Paperless Office (with co-author Richard Harper). Alongside honorary professorships at University College London and the University of Nottingham, she is also a Fellow of the Royal Academy of Engineering, Fellow of the British Computer Society, and a member of the ACM SIGCHI Academy. In scientific research and development, emphasis is placed on research over development. A significant cost is that the two-way interaction between scientific insights and societal needs does not function effectively to lead to impacts in the wider world. We simply must embrace new software and hardware approaches if we are to provide timely predictive information to address global problems, support businesses and inform governments and citizens. The Microsoft Research Computational Science Lab has been pioneering research into software and methodologies to provide useful and usable new environmental information. Our approach has been very joined-up: from accelerating data acquisition from the field with remote sensor technology, targeted data collection and citizen science, to enabling process based modelling-using multiple heterogeneous data-sets in the cloud and enabling the resulting planetary information to be accessed from any device. This talk will demonstrate some of the specific research and development we are doing to accelerate the pace in which important science has impact on the wider world and will emphasise the important insights gained from advancing the research and development together. Always fascinated by patterns in nature, Matthew undertook an ecology undergraduate degree at his local university (Aberdeen) that culminated in his first serious modelling: evolving virtual plants in virtual worlds to understand what determines their form and function. That work took him on to very practical work with the Royal Botanic Gardens Kew where he was a conservation projects officer for several years, conducting research in his free time before finally he cracked and decided he should know what it is he’s talking about. That led to a PhD in mathematics at Heriot-Watt University in Edinburgh, where he acquired more traditional mathematical modelling skills. Since then, he has worked exclusively for Microsoft Research where he thrives on combining scientific understanding of how natural systems work with real world evidence to try to build defensible forecast systems of biological phenomena: diseases, vegetation dynamics, crops, riots, plankton. He is now driven by a realisation that it is possible to generate genuinely valuable forecasts of a lot more than just weather! Dr. Kenji Takeda is Solutions Architect and Technical Manager for the Microsoft Research Outreach EMEA team. He has extensive experience in Cloud Computing, High Performance and High Productivity Computing, Data-intensive Science, Scientific Workflows, Scholarly Communication, Engineering and Educational Outreach. He has a passion for developing novel computational approaches to tackle fundamental and applied problems in science and engineering. He was previously Co-Director of the Microsoft Institute for High Performance Computing, and Senior Lecturer in Aeronautics, at the University of Southampton, UK. There he worked with leading high value manufacturing companies such as Airbus, AgustaWestland, BAE Systems, Rolls-Royce and Formula One teams, to develop state-of-the-art capability for improving science and engineering processes. He also worked in the areas of aerodynamics, aeroacoustics and flight simulation. Code Hunt is a serious game where the player writes code (Java or C#) to satisfy a mysterious oracle in the cloud. The game play advances through a series of increasingly difficult levels. In each level, the player has to discover the goal by studying a stream of test cases that show behavioral differences between the player’s code and the secret algorithm which the oracle in the cloud desires. The cloud-based game engine is powered by Microsoft Research’s Pex system, an automated test generation tool for .NET based on dynamic symbolic execution and the Z3 solver; Pex is now shipping as “IntelliTest” in Visual Studio 2015. Try the game for yourself at http://www.codehunt.com. Nikolai Tillmann is a principal software engineering manager at Microsoft, Redmond. He currently leads an effort to transform Microsoft’s core build system to achieve unprecedented reliability, scalability and maintainability. He is the architect of Visual Studio 2015’s IntelliTest (“Pex”) feature, enabling automatic test case generation for .NET applications via dynamic symbolic execution. Try out Pex on the web at www.pexforfun.com, or play a coding game based on the Pex engine at www.codehunt.com. At Microsoft Research, Nikolai also started TouchDevelop, a cross-platform development environment that enables end-users to write programs for mobile devices on mobile devices; try it for yourself at www.touchdevelop.com. The Z3 theorem prover is Microsoft’s main engine of logic and it is used in a variety of projects. It is rooted in the need for efficient decision procedures in the area of software verification, and it has since been extended into bordering areas. Emerging applications include verification of probabilistic properties of software and other systems, as well as verification and synthesis of biological systems, both constructed and natural. In this talk, I will briefly introduce the core concepts involved in verification(-like) problems, and I will demonstrate how theorem provers in general, and Z3 specifically, are employed to solve many of the subproblems that arise. I will then touch upon the satisfiability problem for the theory of floating-point numbers as an example of the design of a tailored decision procedure for a particular theory. The last part of the talk will be spent on various applications of this and other decision procedures to problems that arise in computer science and in computational biology. Christoph Wintersteiger is a researcher in the Programming Principles and Tools group at Microsoft Research Cambridge. He graduated from ETH Zurich in 2011 and has since been a research intern and a postdoc at MSRC. He works on efficient decision procedures for various logics, and applications thereof in software and hardware verification. Currently, his focus is on finite-domain theories like Boolean formulas (SAT, QBF), bit-vectors, floating-point numbers, and (some) probabilistic theories. Along with applications in verification, he recently became interested in the exploration and verification of biological systems, e.g., chemical reaction networks. He is one of the core team of developers of the Z3 theorem prover, which is Microsoft’s main engine of logic. Dave Yewman | Elevator Speech Inc.
Dave is a strategic communications expert with more than 19 years of experience in the field. A former newspaper reporter and columnist, Dave has counseled senior executives at a variety of companies, managed communications teams and led business development efforts. He has also conducted storytelling workshops and presentation training sessions for thousands of executives at numerous companies, including Microsoft, CA, Clif Bar, Dell, CBS, Ingram Micro, aQuantive, T-Mobile, MercyCorps, DriveSavers, Reebok, Tripwire, Wieden + Kennedy, SnapChat, Zurich Insurance, and Adidas. What is the week-long agenda? The agenda will be full of exciting events including demonstrations, talks, and discussions, which will enable you to interact with and present your poster together with networking events. For more details, review the PhD Summer School 2015 agenda. When should I arrive at Selwyn College? Plan to arrive at Selwyn College no later than 16:00 on Monday, 29 June 2015 for check in at The Porters Lodge. Registration and High Tea is between 16:00 and 18:00. When should I book my travel? Book your travel as soon as possible so that you can be sure to arrive no later than 16:00 on Monday, 29 June 2015 and leave no earlier than 12.30 on Friday, 3 July 2015 when Summer School officially closes. Where possible, fly into either London Stansted or London City Airport, which are closer to Cambridge and less congested. Avoid flying into London Heathrow or London Gatwick airports, which are quite a distance from Cambridge. Cambridge Airport runs flights to and from a limited number of European destinations. How do I register for accommodation? Please register for your accommodation via the link in your invitation by 29 May 2015. Reservations should not be made directly. Request a room for the day that you arrive. When should I check out from Selwyn College? Checkout is before 9.30 A.M on Friday, 3 July 2015. Where can I store my luggage when I check out from Selwyn College? Luggage cannot be left at Selwyn College once you have checked out on Friday, 3 July, but can be stored securely at Microsoft Cambridge whilst you attend Summer School for the morning. What should I do if I require a visa? If you require a letter to support your visa or to present to the port authorities upon entry, download and complete the PhD Summer School 2015 Business Travel Support Letter Questionnaire (DOCX, 93 KB) when you complete your online registration, and send it as an attachment to vvletter@microsoft.com. Your request will be processed and a soft copy of the invitation letter sent by email; if you require a hard copy letter, please provide a delivery address. Note that the team will need at least a week to prepare the letter. What about transportation? You are responsible for getting to Selwyn College and should follow the travel reimbursement guidelines. All transportation during Summer School will be provided, including transfers between Selwyn College and Microsoft Research. What is the dress code? The dress code is smart/casual. Will I be able access the Internet during this event? Selwyn College will offer free Wi-Fi in the bedrooms and public areas. Microsoft Research will offer free Wi-Fi access in the building. There will be instructions available when you access the building. What should I do if I have a special dietary need? Vegetarian options will be provided for all meals and snacks. Should you have any additional special dietary needs, please make sure you let us know when you register. Will I be able to have the contact details of the other attendees? Yes, if you have consented to sharing your details during your online registration. Will I be able to access any of the photographs taken during Summer School? If you consented to sharing your photographs during your online registration, you will have access to the photographs after the event. You will have the opportunity to present your research to other Microsoft researchers and participants during a two-hour poster session. This will enable you to promote and discuss your work with experts in your field and with a wider audience. Poster sessions are scheduled between 12:00 and 14:00 P.M. on Tuesday, Wednesday, and Thursday. During your poster session, you will be expected to stand by your poster so that your fellow students and researchers from the Microsoft Cambridge Lab can have the opportunity to read about your research over lunch and discuss it with you. You do not need to prepare a long presentation, but it is a good idea to prepare a short introductory explanation (perhaps 30 seconds to a minute long) to capture their attention at the start. Don’t worry, it is all very relaxed. Remember to eat lunch yourself! Choose a quiet moment to grab something from the buffet and then return to your poster. For helpful guidelines on how to design an academic poster, visit Designing an academic poster and then click Go to the tutorial. Once you have registered, Sue Duraikan, who returns by popular demand to present her talk on Poster Presentations at the Summer School, will be in touch via email to offer support in preparing your poster. There will also be an opportunity to gain confidential one-on-one feedback on your poster and your presentation skills. We will be happy to print your poster for you if you send an electronic copy (PowerPoint or PDF format) by email to i-suef@microsoft.com before Monday, 8 June 2015. Otherwise, be sure that you bring your poster with you to Summer School. You can print it on paper and have it laminated, but it is worth looking into the possibility of printing it on fabric, which makes it easier to transport.